Qatar is one of the wealthiest nations of the world in terms of income per person, because the Qatar population is small (around 800,000) and the oil / natural gas resources of Qatar are huge. Oil provides around a third of Qatar's GDP and Qatar natural gas reserves are vast - around 5% of the entire world's total. The rest of the Qatar economy is supported by industries such as fertilizers, cement, banking, chemicals, iron and steel, and spin-offs from the petrochemical industry. Geographically the country of Qatar almost feels like a large desert island, a large flat land area surrounded almost entirely by water, bordering Saudi Arabia and United Arab Emirates (UAE). 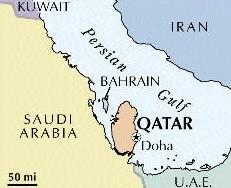 Fresh water is scarce and Qatar has several large desalination plants. Qatar's population is 40% arab and 36% Indian / Pakistani workers. One of the Gulf States, Qatar is well known for Al-Jazeera , the independent TV station broadcasting across the Middle East, with huge influence in the region. Independent from the Qatar government, although still partly funded by it, the TV station is known for objective reporting on many issues and controversial challenges to many kinds of authority. The station has many times carried global exclusive Osama Bin Laden interviews and has given Qatar a profile world-wide that is far beyond what one might expect from it's size. Qatar has a rapidly growing tourist industry and the number of airlines flying in and out each day has increased dramatically over the last five years. Still relatively under-developed compared to Dubai and Abu Dhabi, Qatar is set for rapid expansion in every way under the current leadership. A key event will be the next Asian games in 2006 to be held in the Capital city Doha and could attract hundreds of thousands of people to Qatar during the month of December. Qatar has pledged to spend US$ 700 million to build an Olympic-style city for the 10,000 athletes and several thousand officials who will be taking part. The Qatar games is the first time they have been held in an Arab country. In the last games over 5,500 people took part in the formal opening ceremony before a huge crowd. This is a world-class mega sporting event. The main stadium in Bosan, South Korea, used last time had a seating capacity of 54,000 - although it was hard to fill all the events to capacity. Indeed just four percent of the tickets for the 2002 games had been sold two weeks before the start. Officials were pleading for the citizens of Bosan to support the games. The OCA had projected some US$ 120 million in revenue from the games, but the actual amount was in the region of US$ 68 million. Despite that, the number of athletes and events was greater than ever with many new world records set. The Qatar investment will be huge, to provide a vast range of new facilities including several sports venues and stadiums, a new 36-lane bowling alley complex, new shooting range, horse-racing track and stables The Khalifa stadium complex is also being renovated. Qatar has allocated US$ 2.8 billion to bring Qatar up to Olympic Games standards for the Asian Games 2006. This includes, apart from US$ 400 million for the above projects, US$ 1 billion for the New Doha International Airport. The long term impact of the games will be significant, placing Qatar firmly on the potential destination list for millions of people in 39 participating nations, and creating a great incentive to invest in long-lasting infrastructure which will provide wonderful facilities for the expanding economy over the following twenty years. Expect major investments to arrive in banking, financial services, wealth and education, as well as in development of industrial plants. Qatar will continue to benefit from the "Dubai" effect, a huge growth engine in the region, with escalating UAE prices and labour costs. It will be increasingly tempting for developers and companies to locate in Qatar, if the right incentives can be provided to offset some of the disadvantages of being located near a quieter airport hub than Dubai, which has trully become a gateway not only to the world, but also for the world to many Arab nations. Article written 2006, updated 2008. IT IS VERY GOOD TO GO ALONG WITH THE GLOBAL DEVELOPMENT AND EXPOSURE LIKE THAT OF YOURS. The population has now been restimated at around 1,400,000, mostly due to the influx of foreign labourers.